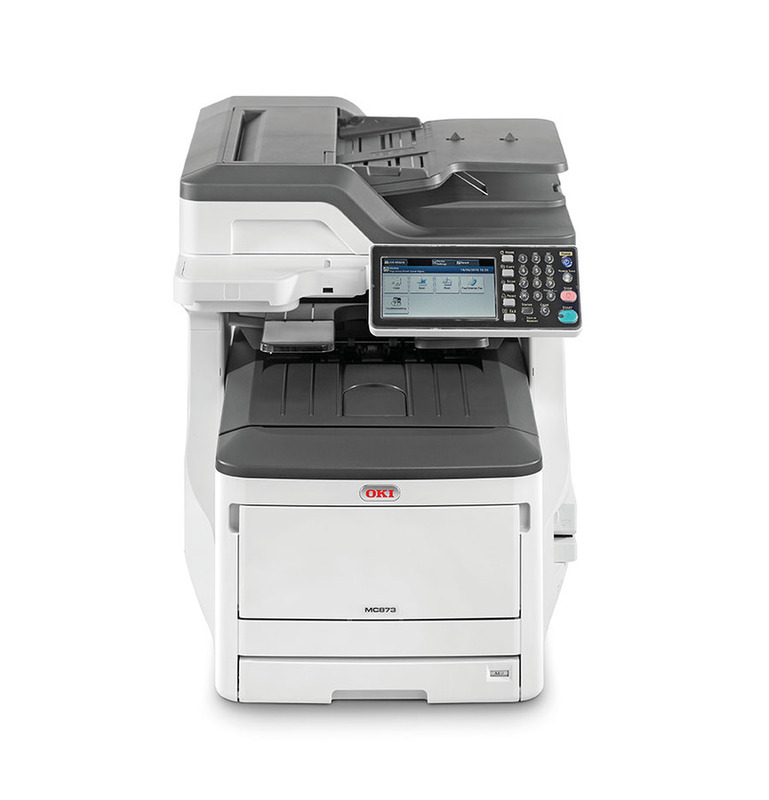 Fast print speeds, efficient consumable, and built-in scan, copy, and fax make the Oki MC873 ideal for a small and busy workgroup. This all-in-one colour LED printer has double-sided copying to save time and minimise paper consumption, and the award-winning digital print technology ensures sharp and clear text and images on a wide range of paper types. Users may be turned off by the high initial price and the expensive upgrades, which they might need to let this multifunction device keep up with their growing and evolving demands. The Oki MC873 is anything but compact with a 64Kg frame that weighs 700mm tall, 600mm deep, and 563mm wide. Despite the imposing build, the MC873 looks tech-savvy and stylish with its seven-inch colour LCD touch screen panel and a minimalist set of keys. The device runs on 1.26GB RAM, with 800MHz processing speed. There is a 250GB hard disk drive for easy storage of certain documents, while keeping them secure in the long run. There are three paper feeders: a 300-sheet tray, 100-sheet multi-purpose tray, and a 100-sheet reversing automatic document feeder. The main interfaces are two USB host ports, a USB 2.0 port, and Ethernet. There is a standard duplexer, and the paper capacity of the Oki MC873 is expandable to 2,005 sheets. The print speeds are up to 35ppm in A4 and 20ppm in A3. It takes 32 seconds for the Oki MC873 to warm up. The intuitive and highly customisable touch screen panel with one-touch buttons simplifies every operation. It is possible to scan directly to a flash drive or to a network folder, email, and other destinations. The fax functions of the Oki MC873 is limited to speed dials and one-touch dials. The scanner's resolution is limited to 600dpi, so it may downgrade the quality of some images. Upgrading the Oki MC873 is expensive. Wi-Fi is optional.